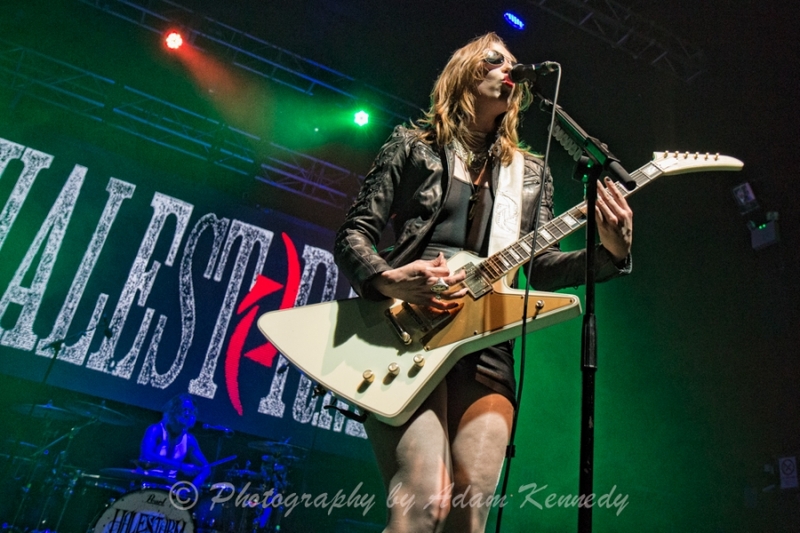 Fresh in from their last show in Nashville, Tennesee, Halestorm is on their non-stop tour schedule carrying them across the Atlantic to the O2 Academy in Newcastle, and the opening night of their 2014 European Tour. 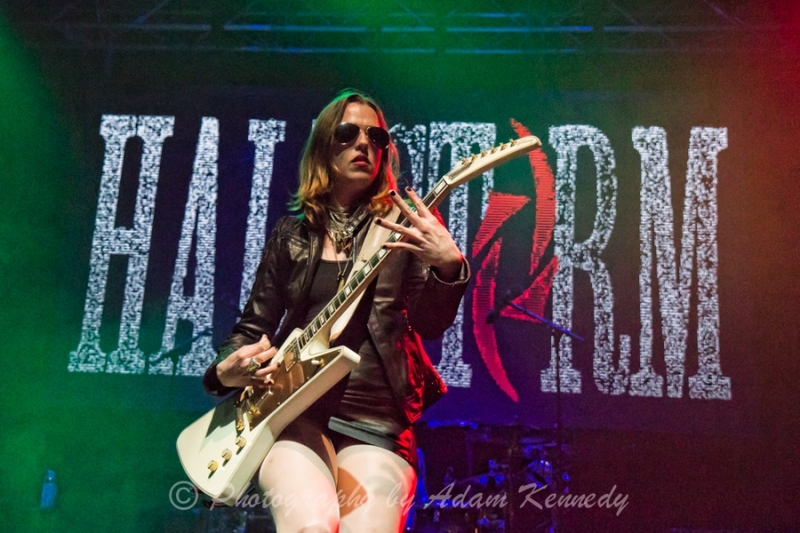 One of the hardest working bands out there, Halestorm is averaging roughly 300 shows a year. This is the bandâ€™s second full headline European tour. 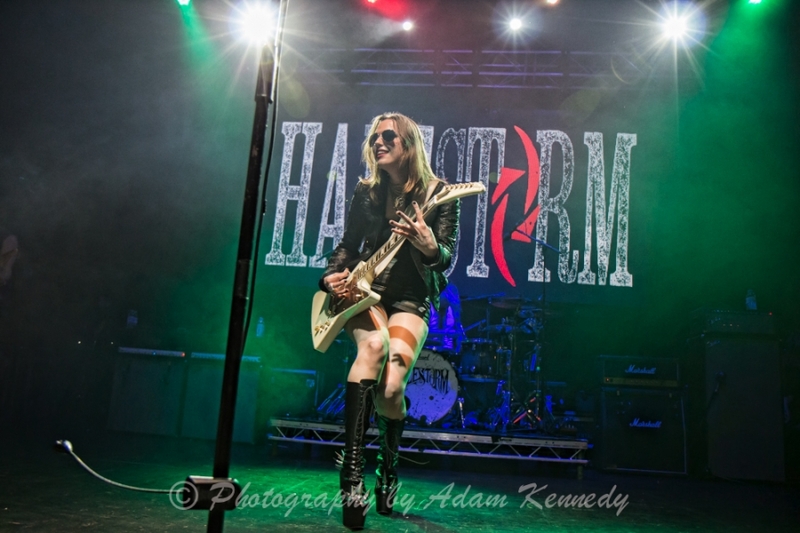 The gloomy North East weather didnâ€™t stop Newcastleâ€™s hard rock crowd from coming out in force to welcome the return of Lzzy and Company to the region. As I arrived at the venue the queue was already wrapped around the building by loyal Halestorm fans eager to get a good spot. The night got off to a flying start with British five piece rock band, The Smoking Hearts, who released their second full album, Victory, last year. Lead singer, Ben Mills, finished their set by rallying the crowd to sing the bandâ€™s final track. 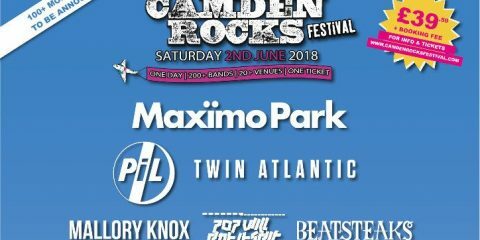 They were followed by Californiaâ€™s DayShell, currently on the road with their dÃ©but self-titled album, leaving the crowd suitably warmed and ready for the mighty Halestorm. The anticipation in the air was palpable. 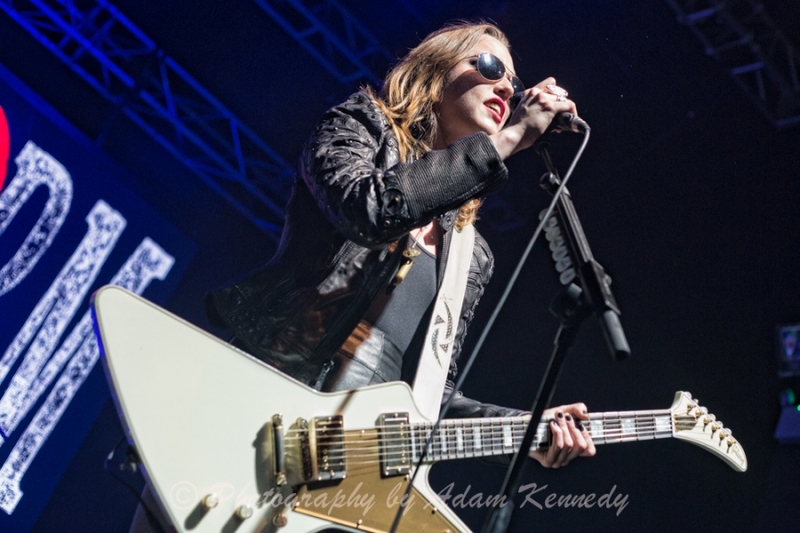 The stage lights dimmed to the sound of the crowd chanting, ‘Halestorm, Halestorm …’ as the band took to the stage and launched into I Miss The Misery. 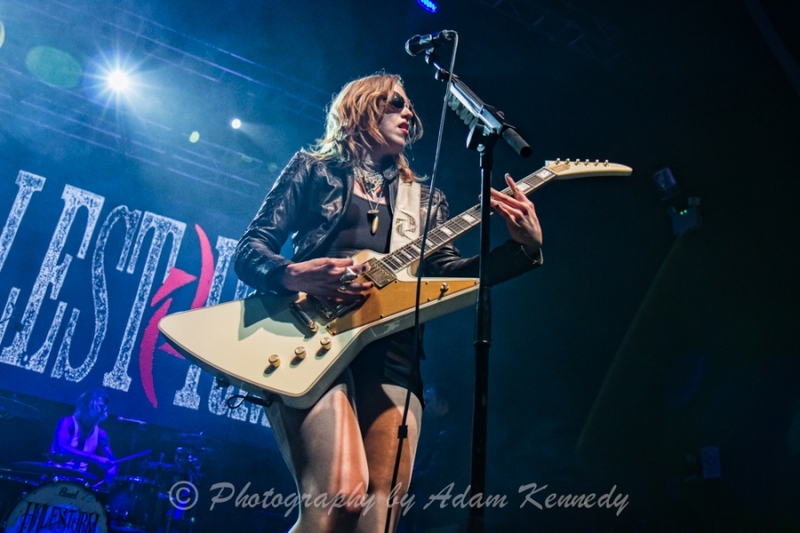 Lzzy Hale wielded her trademark white Gibson Explorer and donning spiky black knee-high boots that even Gene Simmons would have been proud of.  This was swiftly followed by Love Bites [So Do I] from their current studio album, The Strange Case Of…, for which last year the band picked up a Grammy for Best Hard Rock/Metal Performance. 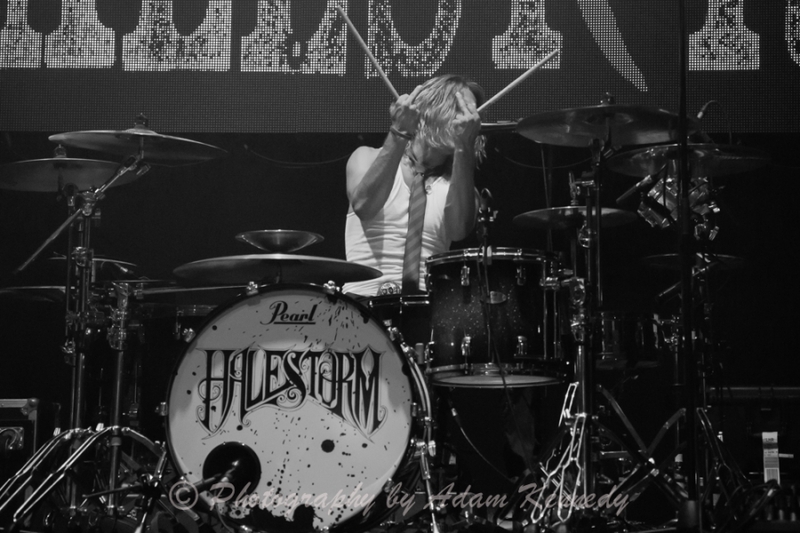 Lzzy informed the crowd that tonight is in fact her brother and drummer, Arejay Haleâ€™s birthday. She playfully mocked her little brother throughout the course of the show, insisting that as his big sister, itâ€™s her right to give him hell. Lzzy also mentioned the band is currently in the process of writing their third record, before performing a cover of Dioâ€™s Straight Through The Heart which was recently featured on the Ronnie James Dio This Is Your Life tribute album. Arms raised and hands clapping from the audience as the band rocked their way through crowd pleasers, Don’t Know How To Stop and Rock Show dedicated to anyone seeing the band for the first time. Lzzy took to the keys and told the crowd that Europe is becoming the band’s home away from home before playing Break In as the fans illuminating the room as far as the eye could see with cell phones and lighters. 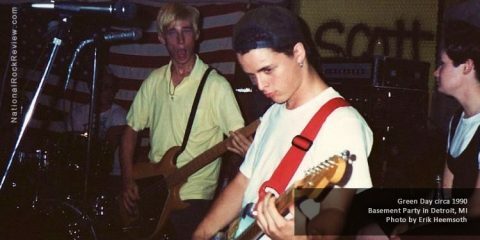 The crowd hung on to every word of Familiar Taste Of Poison, singing back the chorus to the band. Birthday boy Arejay followed with an epic drum solo and the crowd, “Are you going to party like itâ€™s my birthday?” He then took the band into Dissident Aggressor by Judas Priest from the bandâ€™s latest release ReAniMate 2.0: The CoVeRs eP. Lzzy joined Arejay to play the cymbals on the track momentarily before throwing her drumsticks into the crowd and rapidly launching into Mz. Hyde. Lzzy requested the ladies in the audience to lend their voices as launched into Daughters of Darkness and then into fan favorite, I Get Off, from the band’s dÃ©but album. 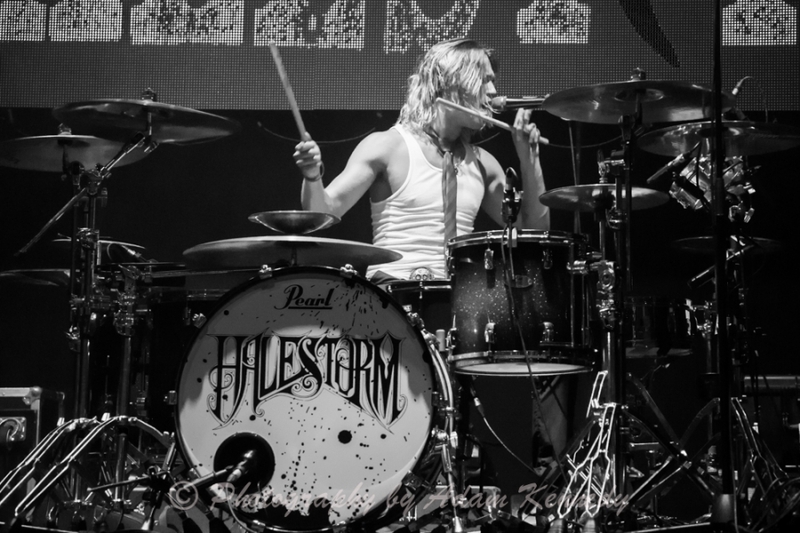 Lzzy informed the crowd, “Newcastle, we get off on you”, again the crowd hanging on to every word and singing back the chorus as Arejay Hale stood aloft on his drum kit. The band departed the stage as this song finished Halestorm’s main set. The band returned to the stage for their encore with the fast and furious new track, Mayhem, showing off a heavier side to the bands sound. This was followed by a rocking cover of Get Lucky by Daft Punk. A birthday cake was brought onto the stage as Lzzy led the crowd into singing Happy Birthday to her brother before bringing their 90-minute set to a close with Here’s To Us, leaving the Newcastle crowd duly rocked and wanting more. 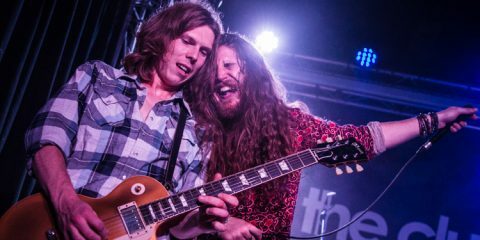 The Pennsylvania rockers’ last visit to these shores saw them take in an arena tour with Alter Bridge and Shinedown. 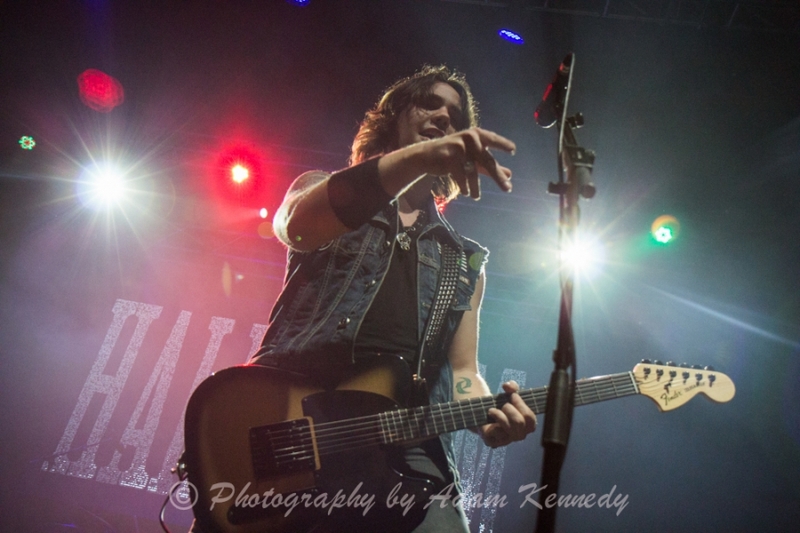 Tonight, the Halestorm faithful got to see their heroes in a more intimate theater setting. This is a band going from strength to strength both musically and their loyal fan base. It wonâ€™t be long before they are headlining arenas in their own right. For those who were there, this was a night that Newcastle will not easily forget.